So you’re in the market for an adventure camera? Gone are the days when an action camera meant buying a GoPro. Increased competition means that you have more choice and higher quality when it comes to choosing a GoPro alternative. I’ve rated and reviewed the best GoPro equivalents on the market. Read before you buy. $256.99 for a number of reasons. The biggest one is the video quality: recording 4K at 60 fps, this is the camera to go for if you want buttery-smooth 4K footage. Footage shot on action cameras can often look unattractively jerky. Yi 4K+ seeks to address this with Electronic Image Stabilization – it makes a noticeable difference to the final output. This is only available in videos shot at up to 4k at 30fps, but you’ll appreciate it when you are watching your videos play. If you really know your way around a camera, you’ll appreciate the Yi 4K+’s ability to shoot images in RAW – allowing you to do a lot more in post-processing. This is definitely one of the GoPro camera alternatives that is aimed at the higher end of the market. Features such as the external microphone support and the emphasis on video quality make it the perfect option for those who want to the specs of the GoPro Hero range, without the hefty price tag. You can even manually control camera settings such as ISO, shutter speed and metering to ensure that you can always get the shot, even in poor light. The Yi 4K’s battery is another plus. You can squeeze up to 120 mins of 4K footage out of the 1400mAh 4.4V lithium-ion battery on one charge. Controlling the camera couldn’t be easier. Opt to use the 2.2” crystal-clear touchscreen, use voice control or the discreet button on top of the camera. Yi4K’s app makes sharing photos and videos from the camera a doddle. You can edit, share or live stream from within the app. Built-in Bluetooth and Wi Fi mean you can connect pretty much to anything, anywhere. Sounds too good to be true right? A camera that’s similar to GoPro but cheaper? Well, the Yi 4K+ does have one big drawback and that is that it needs an external case to be waterproof. That’s a bit of a downer as it’s not a cheap action camera so having to use a waterproof case (provided) is a bit irritating, but not exactly a deal breaker. You can use this camera with the case to depths of up to 132 feet / 40 metres of water. Now, the Yi 4K+ isn’t a straight GoPro equivalent to the Hero 6. There’s no GPS, so no location data on your photos or videos, but how much do you care about that anyway? The Yi 4K+ is the best value GoPro alternative thanks to the wealth of features you get at the lower price. So what makes this stand out as the best budget action camera? Well, for me, the big thing is the wireless wrist remote that is included as standard with the camera. The whole point of a GoPro or any GoPro equivalent is to capture moments that other cameras can’t. This becomes a whole lot easier if you have a wireless remote attached to your wrist instead of having to operate the buttons on the camera. The other thing that sets the Akaso EK7000 apart from other budget action cameras is the ability to use a larger Micro SD Card. The Akaso EK7000 is compatible with cards up to 64GB – double the size of some of the others I’ve reviewed. It’s much more cost-efficient to buy larger cards and you can obviously fit a lot more footage and stills too. Battery life is always a worry, but the Akaso action camera ships with two rechargeable 1,050mAh batteries. As each battery equates to around 1.5 hours of video, you’re looking at 3 hours of video if you fully charge both. Again, that’s a big bonus when you look at the price of buying additional batteries for other action cameras. Sensor-wise, the Akaso action camera packs a 12-megapixel sensor into its small body. Now, the Campark’s 16MP sensor has the edge here but I found that the Akaso performed pretty well overall. It’s no good for filming at night, but that’s not a surprise for a GoPro cheap alternative – low-light shooting is not what they are designed for. The EK7000 shoots 4K video at 25 fps, ie 2.7k video at 30fps – relatively standard at this price point. The two inch LCD is easy to use – with a simple interface that feels familiar straight out of the box. If you’re used to a touchscreen, it will feel a little clunky going back to using buttons but it’s not difficult to operate. You’ll need to use the waterproof housing (included) before taking the EK7000 into the water. Once it’s inside the case, you can take the camera to depths of 30m / 100ft. Connectivity is via Wi-Fi or HDMI – there’s no Bluetooth. Again this is more limited than some of the other cameras I’ve reviewed but was quick and reliable enough to make me happy. 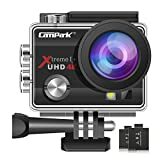 Campark ACT74 4K Action Camera is. 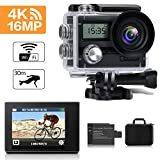 So why have I picked this as the best action camera for under 50? Well, for one, it comes with 4K video – an impressive feature in a camera this cheap. 4K video at 30 frames per second? It’s hard to argue that this isn’t the best cheap GoPro alternative. 1080p video is shot at up to 60fps. But what’s the video quality like? Well, in truth, you’re not going to be making professional videos with it – but if you’re looking for GoPro camera alternatives for high-quality video, you’re going to need to spend quite a bit more money. Still, the quality is more than good enough for most people’s needs – the 1080p actually came out sharper and clearer when I tested it, so I ended up not using 4K as much on this action camera. Camera wise, the Campark ACt 74 includes a 16MP camera – more than capable of handling those on-the-go moments. It also comes with a case that is waterproof up to 30m and uses the same mounts as a GoPro, so you’re never going to struggle to find compatible accessories for it. I’m not a huge fan of an ultra wide-angle lens but they are standard on pretty much every action camera out there – and you can change the settings on the camera itself. As with most cameras that market themselves as a cheaper version of GoPro, the Campark comes with time delay and burst modes, both of which can be very useful. It’s all very well and good having a camera that can take and shoot awesome pictures and videos, but you need to store them too. Supporting SD cards of up to 32GB, the Campark ensures that you have ample storage for your shots. It’s not the biggest, but at this price, I’m not really complaining. Just buy a few extra SD cards with the money you’ve saved on the camera itself. Action cameras are notoriously power-hungry creatures. Is there anything more irritating than running out of juice in the middle of an epic bike ride or dive? Campark’s 1050mAh battery lasts up to 180 minutes, and what’s more, the standard kit comes with an extra battery so you can start the day with not one but two fully-charged batteries. Like many GoPro camera alternatives, the Campark ACT74 also comes with a number of mounting accessories to help you capture that perfect frame. The 2-inch HD screen helps you to control what you’re shooting and is perfect for reviewing your snaps and videos. Accessory wise, the Campark ACT74 really shines. Not only does it come with a waterproof case, mounting kits and an extra battery, they also include a wifi remote control too. This is a serious cost saving – particularly when you consider that GoPro’s own remote control cost upwards of £60. Fitfort 4K action camera has earned a reputation as the best cheap GoPro alternative. There’s not that much to differentiate this from the other budget GoPro alternatives I’ve included, but I thought it was worth reviewing as it is a good contender for the best budget action camera title. The stats alone are pretty impressive. 4K recording at 25 frames per second or 1080p recording at 60 frames per second. It’s not quite as robust as the similarly-priced Campark, but it’s not bad at all. As with the Campark, I thought that the 4K was a little rough around the edges thanks to the 25fps – you’re almost certainly better off filming in HD at 60 fps unless there’s a good reason not to. Camera-wise, you’re looking at a 12MP image sensor – again this falls short of the Campark (which is 16MP) but is good enough to get you clear shots in most situations. Isn’t that really what you want in a good adventure camera? The camera supports MicroSD cards up to 32GB (not included). This is enough to store a significant amount of footage and video, but it’s always worth buying a spare so you’re not caught out by any nasty surprises. 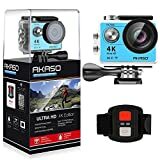 $49.99 your action camera pack? A waterproof case that’s good to go up to depths of 30m / 100 feet, two 1050mAh batteries, a remote control and lots of action mounts to help you capture that perfect shot. These guys have really gone for the low-end market of cameras like GoPro but cheaper, so you get a lot for your money. When it comes to features, the Fitfort 4K is well up there with the more expensive GoPro alternatives. Burst photography, time lapse, loop video – it has all three. Transferring images is a doddle. The Fitfort has built in WiFi. Simply download the accompanying app onto your phone and you can transfer and edit while you’re on the go. Alternatively, you can use the HDMI / USB plug for wired transfers. has a lot going for it… and it’s priced to match. $379.00, it’s more expensive than GoPro’s own action cameras apart from the Hero 6. Garmin is really going for it with the VIRB Ultra 30, which means a high-end action camera that’s one of the best available on the market today. So what do you get for your money? The short answer is a lot. Data-lovers, it’s time to get excited. The Garmin’s G-Metrix sensors record all the data you could ever possibly want. Altitude, speed, acceleration, GPS, bearing, G-force: you name it, it tracks it. You can even overlay the information on top of your footage if you want. Video-wise, the 12MP image sensor can shoot video in 4K at up to 30fps. This doesn’t match the Yi 4K+ or Hero 6’s 60fps but the footage looks nice and smooth anyway. It’s sharp and the colours come out really well – though I’d certainly expect it at this price. The 3-axis image stabilisation on the Garmin VIRB Ultra 30 isn’t quite as good as the Yi 4K’s. But it does make an appreciable difference to footage. The 1.74 inch touchscreen is smaller than the ones on the GoPro Hero range, but the Garmin’s really stands out for the fact that you can still use it when it is in its waterproof case. Garmin have put a lot of thought into usability here – so you can also expect great sound quality while the camera is in its case too. In addition to operating through the touchscreen and buttons, you can control the Garmin VIRB Ultra 30 via voice control. Pretty useful when you consider the number of times you use an action camera in situations best-suited to hands-free control. Connectivity is via Bluetooth, Wi Fi or ANT+ – a combination that means you can connect to pretty much anything and everything. Unlike the GoPro Hero, the Garmin VIRB Ultra 30 is not inherently waterproof. But it does come with its own waterproof case that is safe for use up to 40 metres below the surface. One of the downsides of buying a GoPro alternative is that you restrict the number of mounts and accessories you can access. Not the case with the Garmin VIRB Ultra 30. It uses the same mounts as a GoPro so you can use any accessory or accessory kit that’s been designed with a GoPro in mind. Not sure that GoPro is going to be that happy about it, but it’s a cutthroat game. Does all this tech come at the cost of battery life? Not really. The 1,250mAH battery can last up to 1.5 hours – in practice, I found it was a bit shorter but not remarkably so. the Polaroid Cube+ camera: the best GoPro Session alternative. $123.14 the Polaroid Cube packs a punch. The 1080p action camera is splash-resistant, really easy to use, with a magnetic bottom so you can easily attach it to metal surfaces. The magnet is a great idea. It’s strong enough that the camera felt safely secured and allowed me to capture some shots from cool angles. Essentially, it opens up a whole world of camera angles that you wouldn’t be able to achieve with a standard mount. Now, performance wise, this is not the best budget action camera for either photo or video quality. But what it lacks in specs, it more than makes up for with its simple design. It’s not going to appeal to you if you want something a little more robust in the output department but it’s perfect if you want something quick, simple and fuss-free. You can shoot video in 1080p or 720p – the quality is good enough for sharing on social media or watching on your smartphone. If you need something more, this isn’t the action camera for you. For me, one of the big downsides of the Polaroid Cube + is that it’s not waterproof. On its own, the camera is weatherproof, but you have to buy a protective casing to make it fully waterproof. This is a bit of a shame. The GoPro Session is fully waterproof to 10 metres. Even if Polaroid didn’t want to go for this option, other manufacturers of cheap GoPro alternatives include a waterproof case as standard. By the time you’ve bought the Polaroid Cube+ and a waterproof case, you’re not a million miles away from paying for the Session, which boasts higher video and image quality too. That’s enough to give me pause for thought. When it comes to accessories, Polaroid have gone down the stingy route. There are mounts available for the Polaroid Cube+… but you have to pay for them. If you’re planning to use your adventure camera for a number of different sports, the cost of all the mounts means you’re much better off going for another camera from this list. The 124° lens isn’t as wide as many of the other adventure cameras on this list. I liked this as it meant that images and videos were not as distorted, but again, this is personal preference. Clearly, Polaroid Cube+ doesn’t come with a screen, so you’ll be shooting everything blind. It’s the same with the GoPro Session but can lead to some disappointing footage and missed opportunities. After all of the GoPro alternatives that have been designed to look and feel like a GoPro, it’s refreshing to see an adventure camera taking a different approach. Sony FDR-X3000R’s slimline design and detached live view remote is a world away from most of the other cameras on this list. This can have its benefits and its drawbacks, depending on what you are used to and what you are looking for. The other (and bigger) selling point for the Sony FDR-X3000R is the built in image stabilisation system: Balanced Optical Steadyshot. There’s no getting away from the fact that unless you use a gimbal, footage shot on action cameras can come out quite shaky. Sony tackles this problem straight on, with a camera that focuses on getting buttery smooth footage and shots as its priority. It’s true that the FDR-X3000R footage does come out a lot smoother – I was surprised by how much of a difference it made to videos. Before you get too excited though, I should say that Sony’s focus on image stabilisation means that the camera comes up short in a few areas I’d expect better from considering the higher price. $529.99, I’m not so sure. It does come with an underwater housing, but it’s just more kit to remember when you’re packing. Once you do pop it into the waterproof housing, it’s good to go to depths of up to 197ft/ 60m – to be honest, that’s more than most of us are going to need – but good to know nonetheless. There’s no touchscreen either. You’re looking at button navigation all the way. That said, one of the things I like most about this action camera is the remote view display. It’s particularly handy in situations where you have the camera attached to your helmet, chest or another surface but want to check you’re capturing some quality content. Like the Garmin VIRB, the sound quality on the Sony FDR-X3000R is noticeably better quality than most of the other action cameras I’ve laid hands on – I’d hope so at this price. The wind noise reduction does a good job of clearing out noise from background gusts. The microphone jack is a clear nod at the fact that Sony are aiming for the higher end of the adventure camera market. Apart from the image stabilisation, Sony hasn’t rewritten the rulebook when it comes to the FDR-X3000R’s capabilities. 4K at 30fps, a 12mp sensor – it all looks quite familiar. You’re not going to struggle to connect this camera though: with built in Bluetooth, NFC, wi-fi, GPS, USB and HDMI options, transferring footage onto other devices couldn’t be simpler. Most GoPros and GoPro camera alternatives boast a camera resolution of 4K. Camera resolution is the number of pixels that can be captured by a camera’s sensor. The higher the number of pixels, the sharper each shot should be. There are a number of 4K resolutions but 3840 × 2160 is the widely-accepted standard for action cameras. Every camera in this article except the Polaroid Cube+ is capable of filming in 4K. The next level down from 4K resolution is full HD or 1080 pixels. Although this might seem a large step down, unless you are viewing on a 4K screen, it’s not going to make much discernible difference viewing wise. Fewer pixels mean smaller file sizes and less load on your computer too, so it’s much easier to edit. A step down from that, standard HD is 720p. We all want our shots to come out at a high quality, whatever camera they are shot on. But it’s important to acknowledge the limitations of action cameras when it comes to getting that perfect shot. Action cameras are mostly designed to be use in good lighting conditions – try and operate them in low-light situations and it’s likely that you are going to end up with a low level of image quality. Some of the more expensive cameras perform better on this front, but ultimately if you want a camera that performs well in difficult lighting conditions, you’re better off opting for a mirrorless or DSLR. This is the other important thing to consider when you are looking for a good alternatives to GoPro. The frame rate is the number of still images the camera can capture per second – so frames per second or fps. On the face of it 4K is great for creating crystal clear images, but most action cameras (with the exception of the Yi 4K+) can only film 4K at a maximum of 25 or 30 fps (see table above for quick reference). The lower the number of frames per second, the jerkier or more flicker you’ll get in your video. But when you consider that most cinematic movies have a frame rate of 24 fps, the GoPro alternatives I’ve chosen will still look good in 4K. 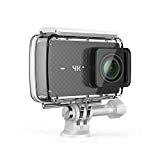 The truth is that you’re better off filming in full HD on most of these action cameras, especially the cheaper alternatives to GoPro – filming in HD rather than 4K means the camera can capture more frames per second for smoother footage. Plus it’s still of a good enough quality to watch on a HD TV without it looking grainy and it’s less drain on the battery. You also need to film at a higher fps if you want to do slow motion video. Wobbly videos are the bane of videographers’ lives. Noone wants to watch a video where the camera’s shaking and the footage is all over the place. Of course, you can buy a gimbal to try and get the smoothest footage, but choosing the right adventure camera can help too. While most action cameras claim to include some form of image stabilisation, it’s only on the more expensive models that you start to see the difference. If image stabilisation is your biggest concern, the Sony FDR-X3000R is the camera for you – it’s image stabilisation system stands head and shoulders above the rest. Jpeg is the standard format on most adventure cameras – one that works well for all but the most avid / semi-pro photographers. If you are looking for an alternative GoPro camera that can shoot in RAW format (which provides you with unprocessed and uncompressed data, meaning you can do a lot more in post-production), you’re going to have to pay for it. The Yi 4K+ shoots in RAW, as does the GoPro Hero 6. The Yi 4K+ is cheaper – it’s your best alternative for GoPro Hero 6 if shooting in RAW is important to you. This really comes down to personal preference. Most action cameras have based their design on GoPros, with very few exceptions. The Sony FDR-X3000R is the only GoPro alternative on this list that bucks the trend: with a design that’s more like a small camcorder than the box-shape that dominates the market. This one’s simple – opt for the action camera with the best possible battery life or buy yourself a couple of spare batteries. The battery life on adventure cameras is quite poor. You’re looking at a maximum of 90 minutes of video (far less if you are shooting in 4K). If you’re planning on shooting a lot in one day, you need to plan accordingly. You can band GoPro alternatives into three broad categories: budget action cameras under £75/$100, mid-range options of up to £250/$300 and high-end action cameras of £250/$300+. Know that old adage “you get what you pay for”? Turns out, it applies to action cameras as much as anything else in life. You’re not going to get a cheaper version of the GoPro Hero 6 for under 50. The closest thing you can get that’s similar to GoPro but cheaper is the Yi 4K+. Buy a budget action camera and you are going to be sacrificing image quality, 4K fps, and a few other things along the way. The question is does it matter to you? If you are looking for something to just take on holiday and capture a few cool moments, the answer’s probably no. Clearly the answer is going to be different if you’re producing video on a semi-professional level. I’ve chosen the cameras that represent the best value for money at each price point. It’s up to you to decide which price you feel comfortable with. It’s all very well and good recording all this awesome video and shooting those super-cool stills but how are you going to get them off of your camera and onto your chosen device to edit and share them with the world? These days there is such a mind-boggling array of ways to connect. They can all sound appealing: NFC, Bluetooth, Wifi etc – but really you need to consider two things. 1. Will you use that particular method of connection. 2. How reliable is it. For example, I have NFC on my Sony A6000 and I’ve never used it. I also often find myself repeatedly having to switch my GoPro Hero on and off again a number of times before it will connect to my phone. I didn’t have issues with any of the cameras I reviewed but it’s always worth doing a test as soon as you get yours and sending it straight back if there are repeated glitches. The other thing you should consider for connectivity is whether you can connect a remote control. A remote control broadens the scope of angles and uses for your action camera. Again, this is only useful if you have a reliable connection. You don’t want to miss that perfect shot. Does it come with additional mounts or clips? Does it include a remote? Is it compatible with GoPro fittings (meaning access a large inventory of aftermarket accessories). How large is the LCD screen?